Article published (two years after I left UCL) on my master's thesis. C. Hornsby , C. H. C. Leung, "The design and implementation of a flexible retrieval language for a Prolog database system", ACM SIGPLAN Notices, v.20 n.9, August 1985. I only discovered it by chance years later. I neither wrote it or read it, but presumably my supervisor must have found something of value in the work. K. Ahmad, P.R. Holmes-Higgin, C.P.W. Hornsby, A.J. Langdon, "Expert systems for planning and controlling physical networks in the water industry", Knowledge-Based Systems, Volume 1, Issue 3, June 1988. Hornsby, C., Holmes-Higgin, P.R. & Ahmad, K., "The Water Industry Expert System Support Environment", In D.S. Moralee (ed. ), Research and Developments in Expert Systems IV. Cambridge, UK: Cambridge University Press, 1987. [Cant find an online copy anywhere]. I also gave a paper at a conference in Lausanne in 1987: K Ahmad, CPW Hornsby, AJ Langdon, "Expert systems in urban storm drainage", Proc. 4th Intl. Conf. on Urban Storm Drainage, Lausanne, Sept 1987. But apart from the fact that it was my first conference presentation and that I found there was a free festival on at the end of the event (at which Public Image Limited played, though I remember they were hard to like), I remember nothing. P. S. Katsoulakos , C. P. W. Hornsby and R. Zanconato, "DEEDS : The Diesel Engine Expert Diagnosis System" I Mar E, paper 22, Conf. on Maritime Communication and Control, London 26-28 October 1988. Katsoulakos, Banisoleiman, Hornsby, Vekaria, Morgan and Ruxton, ""Design and Development of CPMPS", A New Generation of Engine Management Systems", 18th International Conference on Combustion Engines, CIMAC, Tianjin, 1989. Katsoulakos & Hornsby, "The Impact of IT and Advanced Information Systems in Future Fleet Management". SNAME April 12-15 1989, New Orleans, 1989. Hornsby, C. P. W., "Expert Systems in the Marine Environment," Oil Tankers in the 1990's, Lloyd's Register, London, April 1990. Blanke M., Lunau C., Hornsby. C., "KBSSHIP-Communicating. Expert. Systems for Ship-Wide Decision Support'. Proceedings of CAMS-92 Workshop on Artificial Intelligence, Control and Advanced Technology in Marine Automation, Genoa, 1992. Hornsby, Report on the KBSSHIP project, Maritime Communications and Control, Marine Management Ltd, London, 1993. Most of these I'd forgotten about (I didn't get to go to the conference). Katsoulakos P.S. and C. Hornsby, "Expert Systems and Marine Applications", Trans IMarE, Vol.101, No.1 1989. Won the Denny Gold Medal for best paper of the year, though rereading it now, I wince. Katsoulakos, P.S., Hornsby, C.P.W. 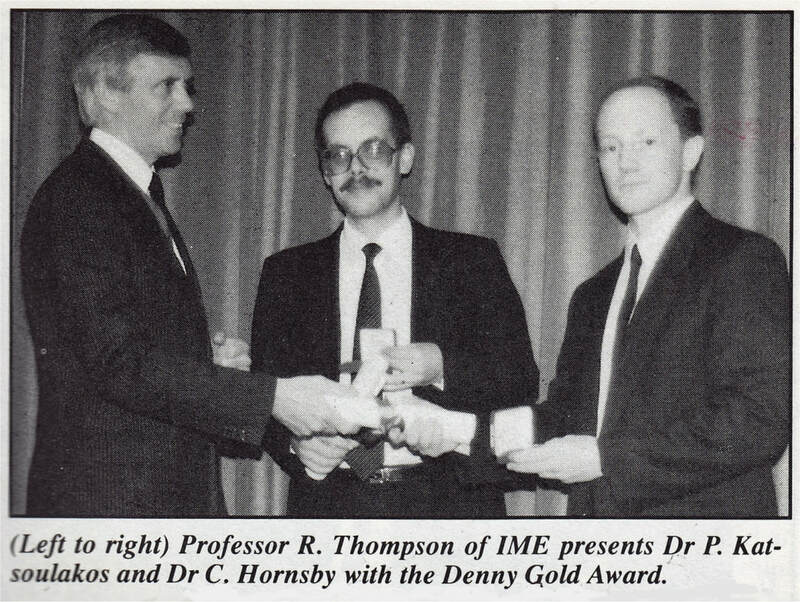 and Rowe, R. "Advanced Ship Performance Information Systems", Applications of New Technology in Shipping (IMAS), Athens, 1989. Buxton, J.L. and Hornsby, C.P.W., "Shipboard Software-Based Systems and their Classification", Trans IMarE , Vol. 103, part 6, March 1991. H Haughton, C Hornsby, P Jacob, D Robson, "Static analysis, verification and metrics", in ed. Zuylen, The REDO Compendium: Reverse Engineering for Software Maintenance, Wiley, 1993. At Shell, we were actively discouraged from publishing externally. I did write a nice piece on organisational analogies and lessons they might teach us in 1992. I can't imagine anyone would object if I posted that here. It has some nice sections, especially given that it was written 25 years ago. 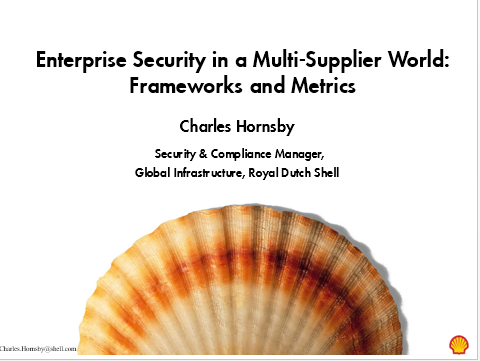 "Enterprise Security in a Multi-Supplier World", SecureAsia Conference, March 2009. "Business Continuity Management and Disaster Recovery in a Global Outsourced Organisation", World Continuity Congress, 8 July 2009. "Managing Persistent Threats", SecureAsia Conference, March 2011.